Introducing the TRIOS IntraOral Scanner! The 3Shape TRIOS® is a wireless handheld device that allows for freedom of movement and ultimate comfort for the patient. It’s like we’re holding a toothbrush in your mouth! This small intraoral scanner can be gently moved around while transferring digital pictures to the screen. We’ll move it around each surface of your teeth and jaw, and you’ll see the real-time digital impression appear on the screen. It’s that easy! 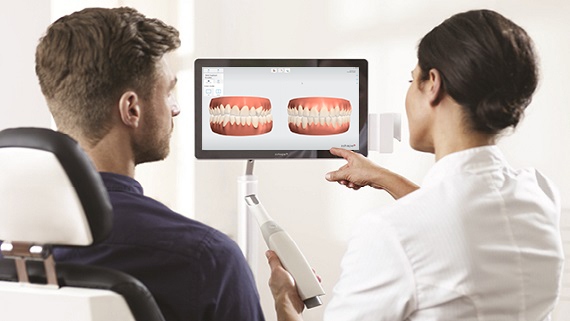 Using a TRIOS Scanner is much faster than taking dental impressions, and more accurate. The digital impressions capture high resolution images of your teeth and mouth that are in full color and very realistic. This helps you and the dentist see exactly what’s happening and where. No hidden corners or shaded areas; just bright and accurate digital impressions. The TRIOS Scanner also captures bites in real time, giving us a detailed view of different bite positions and occlusal contacts. Our understanding of your bite is enhanced with contacts highlighted. After we’ve scanned both upper and lower jaws, we scan a small part of the bite. Then, we put your whole jaw together on the screen to identify any bite or jaw problems. We’re sure you’ll be impressed with the 3Shape TRIOS® because of its ease of use, which makes your trip to your Ballwin family dentist more comfortable and fun than ever! The physical dental impressions took a lot of your precious time. But now, the Trios Scanner can have your digital impressions done in under a minute! Come see your Ballwin cosmetic dentist today and let our office show you how easy and fun it is to use the 3Shape TRIOS®. We think you’ll be impressed!